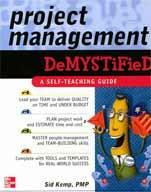 For those on a budget this offers an opportunity to learn Project Management with this easy to read budget priced guide. Obviously a book is never as good as a course....but this may well be the next best thing. - Lead your team to deliver QUALITY, on TIME and UNDER BUDGET. - PLAN project work and ESTIMATE time and cost. - MASTER people management and TEAM BUILDING skills. Comes complete with TOOLS & TEMPLATES for real-world success!! !